Garage Door springs come in a number of different sizes and have to be fitted correctly to the door in order for it to open and close properly. While some systems only use one torsion spring, it can be safer if there are two installed. This will provide better balance and ensure that the door opens and closes evenly. Torsion springs allow the drums and cable to raise and lower the door. Mounted on both sides of the door, extension springs are more common in older systems. They can be very tricky to balance correctly if just one gets replaced on its own. For this reason, it's normal to replace both of them at the same time to prevent alignment issues from developing. Without safety cables, springs can be very dangerous if they snap, which is why professional attention is always required. If you suspect there’s something wrong with your springs, please contact one of our professionals ASAP. As previously mentioned, these parts are dangerous to handle as both types store tension in order to balance the door. You can only imagine how much tension is required to balance such a heavy object – and the force unleashed once it snaps! 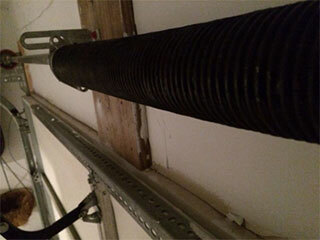 No matter what kind of garage door you have, it's imperative your springs are correctly installed to ensure safety. Our teams of experts have extensive experience and can look after any installation or replacement need you have. We'll ensure your door operates correctly again and that no one is left at risk of injury. We can also lubricate and adjust your springs so that they last their full lifetime before needing to be replaced. Our experts at Garage Door Repair Escondido can help you out with any spring related problem you may be experiencing. When you rely on us, you can rest easy knowing that your door will work correctly again and that you and your family will be safe during and after the installation of a new spring. Call today!